One of the cardinal sins of pitching is having a great pitch deck, but not having your story down. What your company does is not a simple question. Consider the different ways you might answer this question to your significant other, an investor, a team member, or a channel partner. If the messages are all the same for each of those example audiences, you risk losing their attention and possibly alienating them. The key is finding out who your company is to each of your target audiences and moving beyond the facts and goals of the company’s existence. To close effectively, you must have good fundamentals and the ability to strike the emotional connection with investors that they are looking to achieve. Your pitch deck is a visual representation of your company. And as such, its primary goal is to convey what it actually is that your company does.  The pitch in its entirety will cover all key aspects of what your company does in detail, but it is essential to make “what you do” as clear as possible as early as possible in your pitch. Why early in the pitch? Why spell it out clearly for your audience? Simple, your audience is smart and they are human. They don’t like to be confused and they have a limited attention span. When an entrepreneur is not clear about what their company does during their pitch, it leaves their audience thinking throughout your presentation. Guessing what your company is, how it fits within their understanding of that industry, and with every new piece of information (about your market, competitors, etc.) validating whether their guess was right. The audience spends the presentation trying to get ahead of the presenter. To make their judgment quickly and get back to other things. In the end, the entrepreneur is left with an audience who does not know what they do, did not hear anything else that was said, and feels disconnected from the founder and their company. One popular way to describe what your business does is to use another known company or business model as a point of reference. For example: “The UBER of Dogwalking.” This method has the distinct benefit that it can say A LOT in a very short time. When you read “UBER of Dogwalking” you likely imagined an application connecting dog walkers with dog owners in a similar fashion to how UBER connects drivers with people seeking rides. You understood my business right away. This method relies heavily on your understanding of what UBER does to convey what my company does for a different market or purpose. While this can be effective, it is a somewhat debated approach. For one, for truly innovative companies finding a comparative company or business model may be hard to do. What they do is just that unique. Using a comparison would constrain the audiences’ view of their business capabilities. On the other hand, using a comparison company that your audience does not know or that your audience has negative associations with could tarnish your image before you even get started. If you do choose to use this method, use it very carefully. Ask people who know you or work with you. Oftentimes an outside perspective is all that you need. You’re very close to your venture. You work on it most days, and think about it all the time. You’ve been a part of its birth and growth since the beginning, and know everything that was planned and what parts of the business got dropped or changed overtime. All of this information may be clouding your view. An outsider or someone who is not as close to day-to-day operations may be better able to describe what you do in layman’s terms. Ask a few people to describe to you in one or two sentences what your company does. Reach out to your family, friends, colleagues, and perhaps even a customer. Make sure to get a few people’s points of view and compare them to each other as well as your understanding of what your company does. Just because your company and industry is complex, does not mean the way that you talk about it has to be. You are the owner of your company; it is your baby. You know every little detail. You’ve felt the pain of every struggle and pivot. You know your product inside and out. You remember the angry customer and exact situation that forced you to design that new feature. But your solution is not defined by the details, but rather the macro-level benefits given to your customers. Focus on that next level of what your company does. It’s not that you “Built a complex multi-functional application that stores information about client needs, stores details, ratings and availability of providers, and allows for instant communication, scheduling and payment of services rendered.” But rather “We connect busy pet owners with available, vetted and local dog walkers to care for their pets when they cannot.” Think about the implications of your product, to more simply and succinctly define what it truly is. In Simon Sinek’s book “Start with Why,” we are introduced to the concept of the golden circle (see image above) in which “why” is at the center and radiating out in concentric circles is “how” and then “what.” Knowing your company’s “why” will help you to share with your audience the most compelling version of what you do. To figure it out, start with defining your “what.” What are the basic actions you and your team do? Who are the players? Who provides what to whom? When? Then move out to how. How is it all coordinated or organized? What is it that you bring to this business that enables it to run? How are your goals achieved? Then finally to why. Why are you doing what you are doing? Why do your customers buy what you have? What will the world look like after your business has succeeded? Knowing your true and most elementary “why” will help you and your company succeed in the long run. Letting this exercise inform how you define what your company does, will enable you to connect more deeply with your audience and improve their understanding of your company. After some introspection, you should be able to distill what your company does down into one simple sentence. Simultaneously as short, as powerful and as clear as you can make it. Share this with your audience early in your deck. It may have its own slide and it may not, it’s up to you and the story you are trying to tell. But whatever you do, be sure to convey your answer to “what do you do?” early in your pitch deck. For more information on what your pitch deck should cover, visit the full Pitch Deck Content Series.